Genesis 11 gives an account of humanity’s refusal to obey the Lord and their attempt to be great apart from the Lord. The people departed from God’s original command to be “fruitful and multiply and fill the earth” (Gen. 1:28). This command involved a spreading of the glory of God by means of procreation and productivity. After Noah left the Ark, this command was repeated (Genesis 9:1). Sadly the descendants of Noah did not heed this command. By the time we come to Genesis 11 the people were not submitting to God and spreading the glory of God. Instead, they are settling in one place and wanting to make a name for themselves. They strived to achieve this by building a city and constructing a tower. This section is divided into two parts, the people’s pride (Gen. 11:1-4) and the Lord’s power (Gen. 11:5-9). This event brings to a close the first major section of Genesis (1-11), which consists of four major events: Creation (1-2), Fall (3-5), Flood (6-9), and Babel (10-11). At this time there was only one language spoken (Gen. 11:1). The unity experienced in the gift of language that was given by God was not being used for the purpose of glorifying God and providing good to others. This is demonstrated by the people’s pride. After moving east, “they found a plain in the land of Shinar and settled there” (Gen. 11:2). The people described in this passage demonstrate their pride by means of their plans and purpose to build. This is expressed through two invitations to “come” (11:3 and 4). Their plans were to make their own bricks, build a city, and construct a tower. The purpose of their plans was to make a “name” for themselves. Their way of achieving this is by means of human effort apart from God. This stands in stark contrast to the way God promises to make Abraham’s name great (cf. Gen. 12:2). The building of this city and the construction of the tower were their attempt to find satisfaction in their own efforts and it was a monument to their greatness. The plan for the tower was for its peak to be “in the heavens” (11:4). This was a display of their endeavor to disregard dispersion and to pursue power. In rejection of the mandate given to Adam (Gen. 1:28), and reiterated to Noah (Genesis 9:1), the people are refusing to follow God’s way but to pursue their own. This second scene reveals the sovereign power of God. God is described as having “came down to see the city and tower, which the children of men had built” (Gen. 11:5). This description shows the great power of God in contrast to the puny efforts of man. Their huge structure was so small God had to go down to it. So as to prevent the fruition of their united corrupt cause, God will divide this cause by issuing judgment (Gen. 11:6). The Lord said, “Come, let us go down and there confuse their language, so that they may not understand one another’s speech” (Gen. 11:7). This act of judgment prevented the project, and made it necessary for them to scatter as they assembled in groups that spoke the same language (Gen. 11:8). The name of this city was “Babel”. 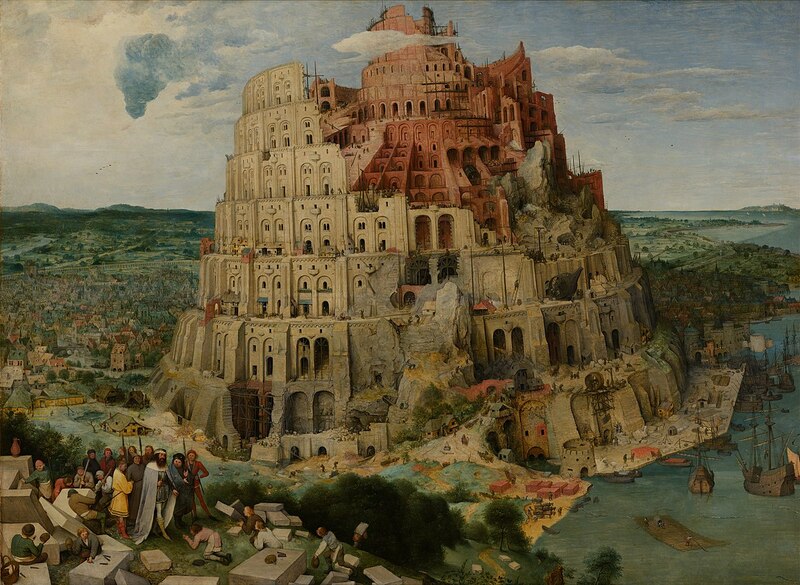 The name “Babel” means “gate of God”, but here it is connected with a similar sounding word in the Hebrew (balel) meaning “confusion”. This is not the last time the reader hears of this city. The same word is translated “Babylon” and “Babylonians” every other occurrence in the Old Testament. Throughout Scripture, Babylon represents godlessness, opposition to God, persecution of the people of God, the pride of man, and false teaching. From its beginnings, Babylon has opposed the ways of God and it will do so until its final destruction. This city wanted to be great apart from the Lord. The first recorded organized religion took place in this event, and God came down in judgment. Scripture speaks of her coming doom and destruction (Revelation 17-18). As seen in the passage in Genesis, the people said, “Come” (11:3 and 4). God responds to their rebellion and said, “Come, let us go down” (11:7). The Lord issues one more “come” with relation to Babylon. The Lord warns His people, “Come out of her, my people, lest you share in her sin, lets you share in her plagues; for her sins are heaped high as heaven, and God has remembered her iniquities” (Rev. 18:4-5). The day is coming when God will throw down this evil city once and for all, and she will be found no more (Rev. 18:21).